The 2017 report of the UN High Level Commission on Health Employment and Economic Growth sets out a vision for a needs-based, fit-for-purpose health and social workforce, which “should be geared towards the social determinants of health, health promotion, disease prevention, primary care and people-centred, integrated, community-based services“. The draft 5 year action plan for Health Employment and Economic Growth has two goals; Invest in both the expansion and transformation of the global health and social workforce. Health workforce transformation is one of the four prioritized strategic entry points for action on SDH. 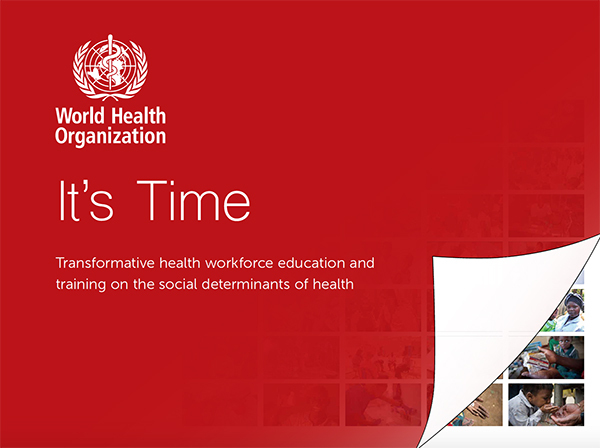 The WHO eBook shown below will provide guidance for transformative health workforce education and training on the social determinants of health. It draws together work on social determinants of health across WHO programmatic areas, and presents essential themes in a concise and succinct manner, using new learning media in a way that engages and inspires the reader. This eBook should be available by August, 2017.